Our goal at Fennemania is to provide high quality OEM Matched compatible HP Designjet ink cartridges that are designed for you digital print heads and media compatible, 100% Guaranteed. Fennemania’s premium based ink also provides exceptional durability & media compatibility. Just Plug & Print compatibility allowing the user to switch inks without the need to flush the lines or change the color profile just like the original. Inks designed to match Original Equipment Manufacturers (OEM) inks, enabling customers to introduce them to their printer with no need for profile change or system flush. Plug & Print compatibility allowes the user to switch inks without the need to flush the lines or change the color profile just like the original Hewlett Packard inks. Outdoor durability and resistance to fading without lamination are also guaranteed to OEM specifications. Just like the stunning color gamut, accurate color reproduction on a wide range of media. Our products and services provide a way for businesses and individuals to cut costs and make money while sustaining high quality and performance. Matched OEM inks made in the EU at wholesale prices! With over 23 years of graphic experience in providing value-added solutions to customer needs, Sytze Fennema has a background of achieving sustained growth in businesses operating in fast moving, B2B, customer focused manufacturing environments in global markets. Able to operate at all levels in businesses along a business value chain. As an outstanding team leader and player, with the flexibility, management style and capability to manage, direct and remotely located, multi-cultural teams. 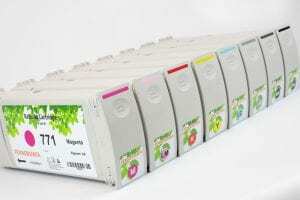 He believes that with our compatible ink we can support you were needed, with quality as well in price.